We’d love your help. 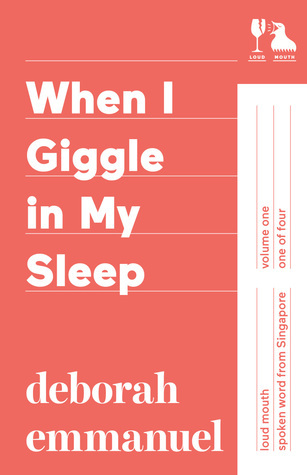 Let us know what’s wrong with this preview of When I Giggle in My Sleep by Deborah Emmanuel. These poems have emerged from seminal platforms such as the Singapore Poetry Slam™ and Lit Up Singapore. A few of them have made their way into video and audio art projects, while others have even represented Singapore at prestigious internati Tested before thousands of people of all ages and backgrounds, these are spoken word scores for the listening ear and thinking mind. To ask other readers questions about When I Giggle in My Sleep, please sign up. A beguilingly beautiful collection of the personal and the political. Words that weave like limbs on trees. Simultaneously melancholy and uplifting. Make sure you grab at the opportunity to see her perform if she's ever in the same corner of the world as you. This book makes poetry come alive to me. I read it during an airport stopover, and I was surrounded by fluorescent lights and impatient people. I found respite in these pages. Deborah Emmanuel (b.1988) is a Singaporean poet, performer, and multiple TEDx speaker. As a slam poet she has featured at festivals like the Barcelona International Poetry Festival, the Makassar International Writers Festival and the Queensland Poetry Festival and won competitions in Singapore, Germany and Australia. Her work has featured in places like Bali, Berlin, London, New York City and Kath Deborah Emmanuel (b.1988) is a Singaporean poet, performer, and multiple TEDx speaker. As a slam poet she has featured at festivals like the Barcelona International Poetry Festival, the Makassar International Writers Festival and the Queensland Poetry Festival and won competitions in Singapore, Germany and Australia. Her work has featured in places like Bali, Berlin, London, New York City and Kathmandu, and s​he has toured alongside​ ​people​​ ​like​ ​Anthony Anaxagorou​ ​and Sarah Kay​. Deborah’s first collection, When I Giggle In My Sleep, was published by Red Wheelbarrow Books early 2015. Her creative non-fiction work Rebel Rites, was self-published in 2016. Genesis is her third book. When not making poems, she can be found making music with Wobology, Mantravine, The Ditha Project, and Kiat, acting on stage and facilitating workshops. Her most recent work experiments with moving poetry into the physical body. She has just started making visual art as a new way to experience metaphor.